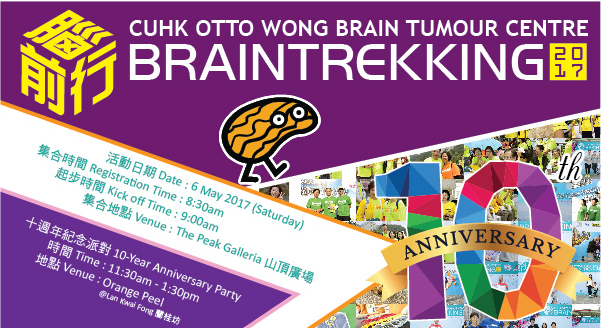 You are cordially invited to participate in the “Brain Trekking 2017″ organized by the Chinese University of Hong Kong (CUHK) Otto Wong Brain Tumour Centre annually. This is their 10th charity walkathon and the past ones attracted many brain tumor patients, survivors and their families to attend. Many medical professionals and the public who support brain tumor patients and survivors were also attracted. This year, we would like to invite you to join this meaningful activity in order to show your support to brain tumor patients, survivors and their families by action! Brain Trekking is the Hong Kong chapter of a global awareness program, “Walk around the world for brain tumours”, organised by the International Brain Tumour Alliance (IBTA). The program was introduced to Hong Kong in 2007 and was well received. Afterwards, it has become an annual activity and the number of participants increased every year. Many brain tumor patients, survivors and their families were attracted to the activity also. The total mileage of worldwide supporters will be accumulated with the goal to circling the world 5 times. In Hong Kong, we raised 1400 km in 2016. Through you participation, it is hoped that more public concern on brain tumor patients and their families can be raised so that they can get more support! After registration, please reply to this email to inform us your name, total no. of participants and contact no. so that we can contact you on the event day. Please support brain tumors patients and be side by side with them to fight against cancer! !